After working a few card tricks, how many times have you been asked "Can you tell fortunes with cards?" 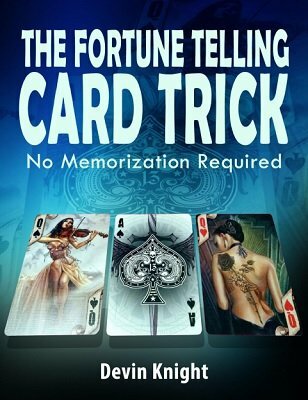 Fortune telling with cards has always been interesting; but, how many of us have wanted to spend the time to learn and memorize the meanings of all the playing cards? I would dare say, very few of us. Besides, there is no trick to it. Now you can say, "Yes." Not only that, but you can actually tell people how many brothers and sisters they have, how many children they have including their gender, number of pets and the month of their birthday, including their current age (without doing any calculations in your head), something important that happened in their lives, including describing their best friend. You can do this with a perfect stranger you know nothing about! They positively do not write it, whisper it to anyone or tell a living soul. They just visualize it by dealing a few cards, while your back is turned, which are later shuffled by the performer. Remember, you can do this with a person you have never seen before. You do not know the facts until after you shuffle the cards and deal them out in a series of circles. Then you read the cards as they fall. The cards tell you all these interesting facts about anyone through an ingenious method. Believe it or not - this is an actual fact. You can perform these feats thirty minutes after reading the instructions. You do not have to memorize the meanings of cards as in former methods. Just deal the cards out and read them as they fall. You can tell people they were born on such and such a date, during the month of so and so, and their age without doing any calculations of any kind! You can tell them how many brothers, sisters, and children they have. You can describe people's best friend, and they have to admit that each and every item is correct. This is not a mathematical or number stunt. No writing. No whispering or anything. Just a deck of cards, it sounds like a miracle, which is just how it appears. This is so simple and clever that you will say, "Why didn't I think of this long ago?" There have been several versions of this in the past including versions by U. F. Grant and Del-Ardo. This is Devin Knight's updated version.